This strongly enhanced false color view is a departure from the familiar bluish north and golden south seen in natural color Cassini spacecraft images, but the contrast between regions north and south of the ring shadows is here more readily apparent. The northern region is marked by a multitude of bright, patchy clouds. The region south of the ring shadows contains the bright equatorial band seen in many monochrome Cassini views taken at infrared wavelengths (see PIA07590 ). Taken just minutes after PIA08936 , this view makes Saturn's rings faintly visible at lower left. The false color enhancement brings out additional detail in the planet's clouds that is not visible in the natural color view. 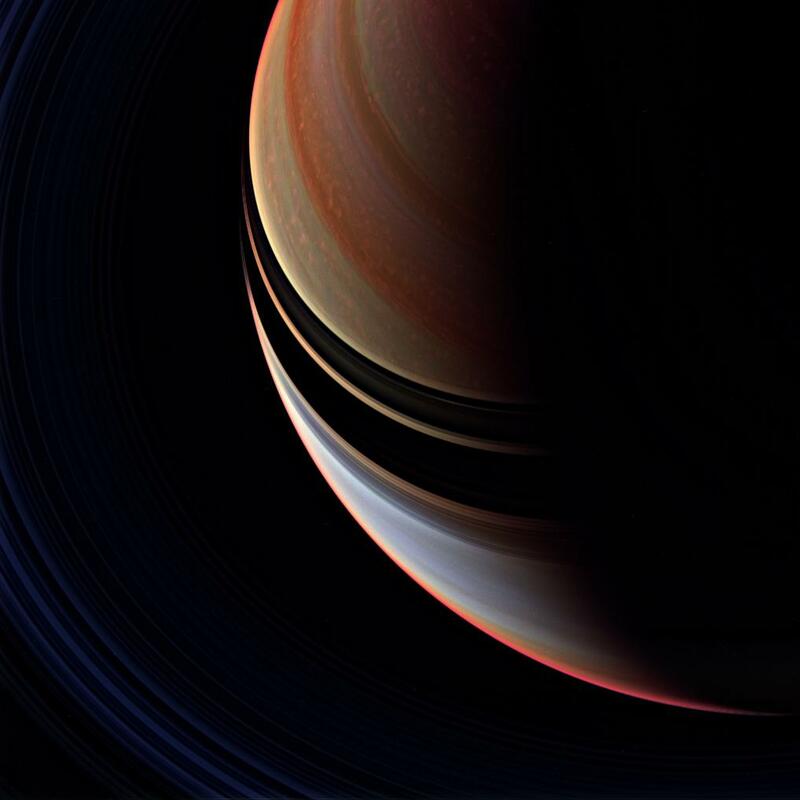 The image was taken with the Cassini spacecraft wide-angle camera using a combination of spectral filters sensitive to wavelengths of infrared light centered at 728 (red channel), 752 (blue channel) and 890 (green channel) nanometers. The view was acquired on April 5, 2007 at a distance of approximately 1.5 million kilometers (900,000 miles) from Saturn. Image scale is 84 kilometers (52 miles) per pixel.